University of Maine's Trevor Coston runs skills drills in front of scouts from the NFL, CFL and Arena Leagues during Thursday's "Pro Day" at Morse Field. 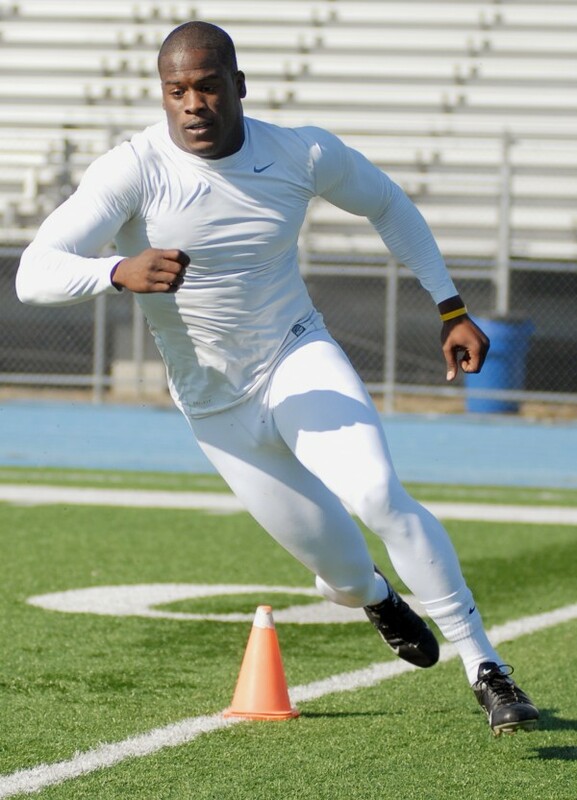 University of Maine running back Pushan Brown runs skills drills in front of scouts from the NFL, CFL, and Arena Leagues during Thursday's "Pro Day" at the University. 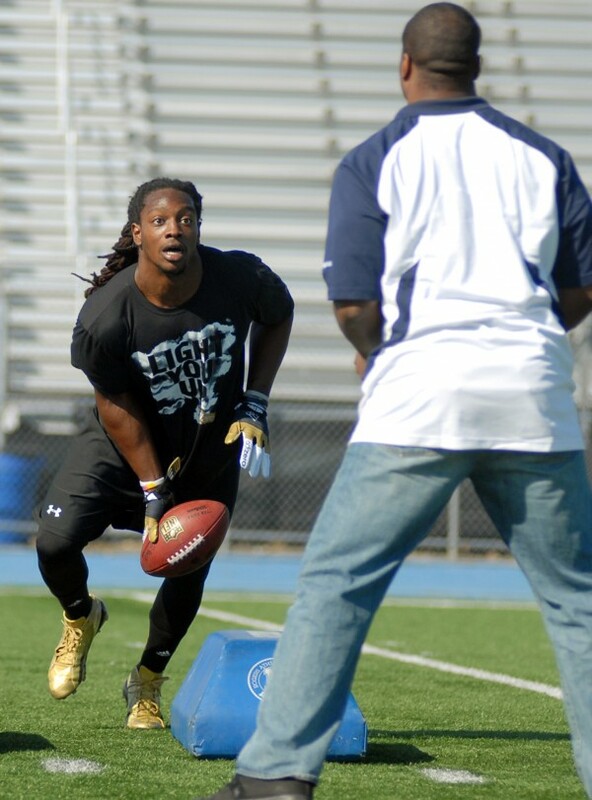 University of Maine safety Jerron McMillian runs skills drills with New England Patriots scout Ronnie McGill during Thursday's "Pro Day" at the University, where Black Bear seniors ran drills in front of scouts from the NFL, CFL and Arena Leagues. ORONO, Maine — Thursday was a day in the sun, literally and figuratively, for the outgoing seniors on the University of Maine football team. Representatives from the New England Patriots, Kansas City Chiefs, Cleveland Browns, St. Louis Rams and Carolina Panthers were on hand to put the UMaine seniors through their paces in a series of activities. They included the vertical jump and the bench press in the Latti Fitness Center before the group relocated to Alfond Stadium to take advantage of the unseasonably warm temperatures. Outside, the players did the broad jump, the 40-yard dash, two different shuttle runs and went through some position-specific drills with approximately 75 teammates, UMaine staff members and fans looking on. “This is a first,” UMaine head coach Jack Cosgrove said of the outdoor session. He pointed out that in 2007, when recently hired UMaine assistant strength and conditioning coach Matt King was a senior, pro day was held in the field house after the Mahaney Dome roof ripped and collapsed under the weight of heavy snow. Cosgrove said he enjoys seeing his players chase their football dreams while applying what they have learned at UMaine. Although UMaine players sometimes have garnered only peripheral interest from scouts, there are some better-known commodities among this year’s prospects. In February, safety Jerron McMillian participated in the NFL Scouting Combine at Indianapolis, where he led all defensive backs with a vertical leap of 36½ inches. On Thursday, he jumped 39 inches. McMillian, who is 5 feet 11 inches tall and 203 pounds, said he has received interest from a handful of NFL teams. He is projected by NFL.com to have “sixth-round value” as a run-support safety. “I feel good about any opportunity that comes and I’m just going to take full advantage of it, too,” McMillian said. 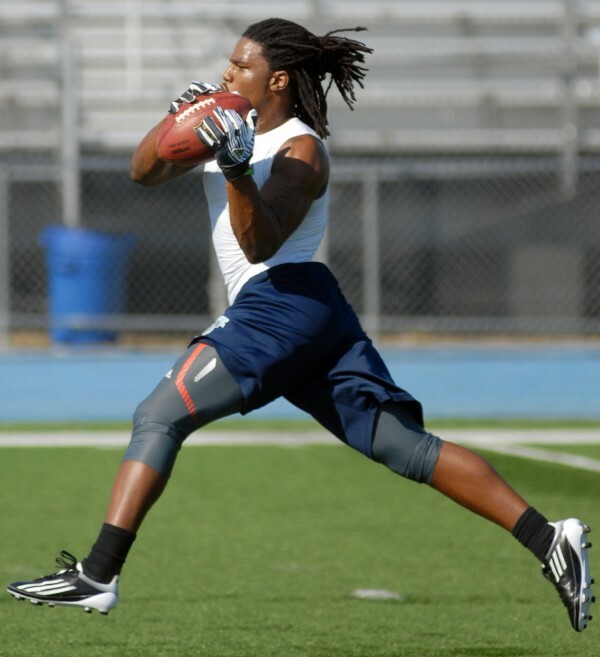 McMillian, who clocked a 4.35-second 40, also led the contingent with a leap of 10 feet, 6 inches in the broad jump. Safety Trevor Coston was second at 10-5. Coston’s stock continues to rise as the off-season progresses. He uncorked a vertical leap of 43 inches, then ran 4.41 in the 40. Coston (5 feet 10 inches and 210 pounds) recently attended a combine in Tampa, Fla., and said he has been invited to another in Detroit on March 31. He also is being evaluated as a kick returner. “I feel like I had a great showing. I got a lot of positive feedback,” said Coston, who thinks his prospects are improving all the time. “I’m definitely creating a little bit more momentum, more buzz, and that’s what I wanted to do, get my name out there,” he added. Among the other former Black Bears who participated in Thursday’s event were defensive lineman Raibonne Charles of Windham, receivers Derek Buttles and Derek Session, running back Pushaun Brown, quarterback Warren Smith and punter Jordan Waxman. Many UMaine team members were on hand to cheer on their former teammates. Several took videos of the drills with their phones and some used their phone as a stopwatch to time the 40-yard dash. “I think seeing this motivates our first-year guys,” Cosgrove said. 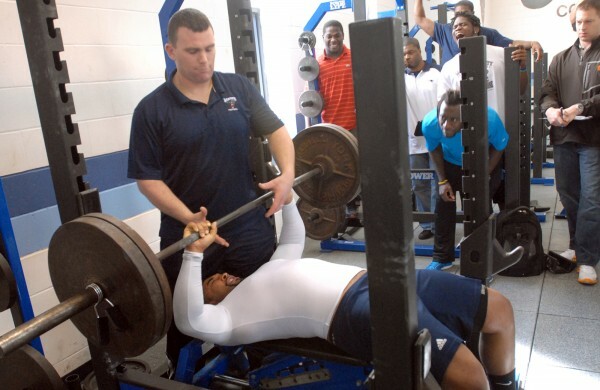 Charles, who had a bit of a hamstring pull, led the way in the bench press, performing 32 repetitions at 225 pounds. Charles said he already has two offers to play professionally in Germany, in Berlin and Stuttgart. “That’s exciting but I’d still like to be over here or in Canada, if at all possible,” he said of the NFL, Canadian Football League or arena leagues. UMaine has helped its student-athletes to excel on and off the field. It takes some of them some time to realize the opportunity that is in front of them. Cosgrove admits having pointed out to younger players that McMillian and Coston came in as “knuckleheads,” but have since matured. McMillian said it was difficult adjusting to life in Orono, but now knows it was beneficial. UMaine’s pro representatives include Mike DeVito of the New York Jets, Jovan Belcher (Kansas City), Montell Owens (Jacksonville), Stephen Cooper (San Diego), Lofa Tatupu (now with Atlanta) and Daren Stone, who is with Calgary of the CFL. Matt Mulligan of West Enfield recently was released by the Jets and is scheduled to make visits to San Francisco and St. Louis. The Black Bears begin spring practices April 5.